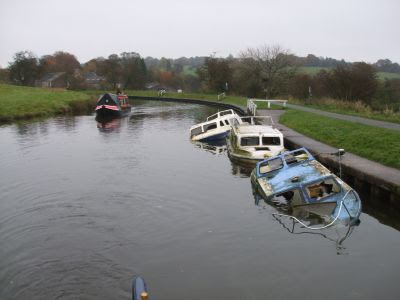 We were hoping to be able to share the Wigan Flight with another boat today, but although someone was moored near the top lock, there was no sign of life when we arrived. 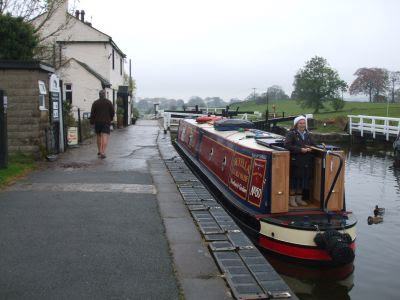 Then it would have been useful to meet a boat coming up, leaving the locks full for us. But that wasn’t to be, either. 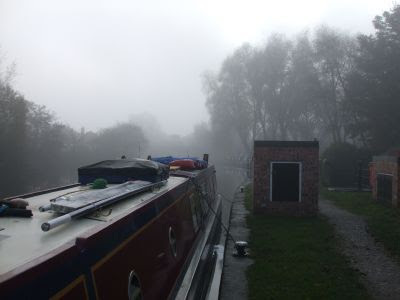 It was a misty morning when we set off from near Haigh Hall, and even mistier at the top of the locks. 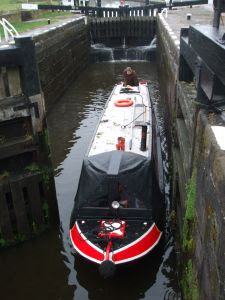 Tanking up at Wigan Top Lock. 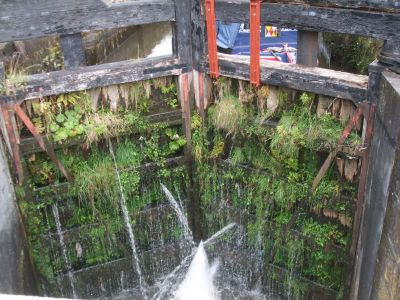 Looking down the flight, 21 locks to the bottom. By the time we’d used the facilities the sun was breaking through, promising a fine day. One down, 22 to go (including the 2 Poolstock Locks). There were plenty of people about, walking dogs and kids, jogging and cycling. 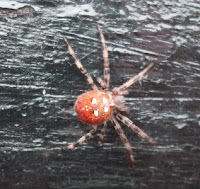 Meg made several new, if transient, friends. Just over half way down and the spire of Church, Wigan comes into view. Not long after here the flight starts to drop into the built up area on the edge of Wigan. 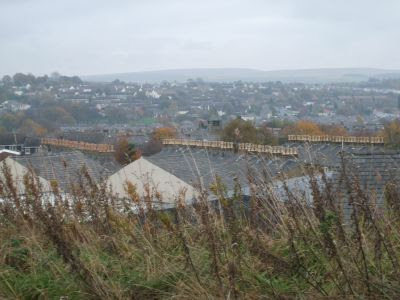 Before this we’d been coming through reclaimed spoil heaps, now attractively landscaped and reclaimed by nature. It’s hard to imagine that alongside the upper section of the flight was a mass of industry, coal mines and iron foundries. The last 3 locks run through another short ex-industrial area, this time the site of a coal fired power station. 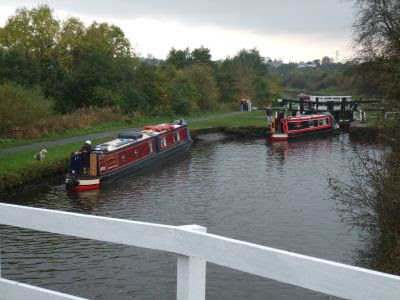 One towpath walker told me how, as kids, they used to cadge a lift on the coal barges coming from the pits near Leigh, in exchange for working the locks. 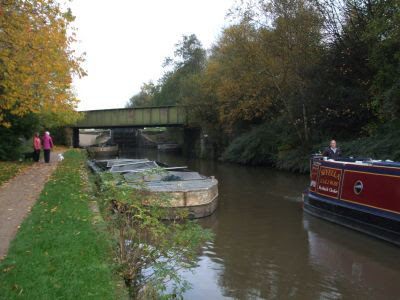 Two railway bridges bracket the last lock (Lock 85) before the junction and our left turn towards Leigh and Manchester. There are actually 2 more on the flight, but 86 and 87 are off to the right, on the main line to Liverpool. 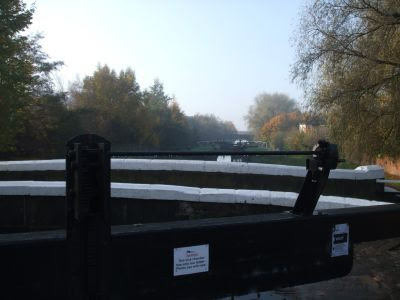 Onto the Leigh Branch, and a couple more locks close together drop us onto the long, level pound which runs all the way into Castlefield Junction in Manchester, and down to south of Preston Brook Tunnel if you go right at Water’s Meeting. 40 miles of water, in all. Poolstock No 2, the last for a while. 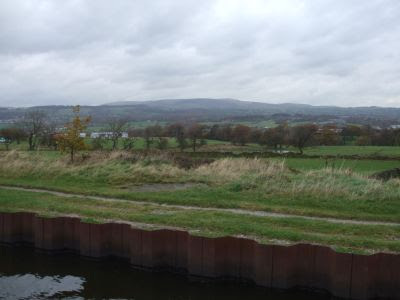 Heading towards Leigh, the canal passes through an area of mineworkings from which all trace of the industry has been removed, apart from the large flashes either side, caused by subsidence as the coal below was extracted. 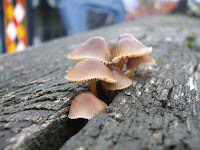 These are now nature reserves. About 45 minutes from the last lock we pulled over at The Dover Lock Inn. No locks here now; there used to be 2 but these were moved to the other side of the junction when the levels changed due to mining subsidence. It’s a handy place to stop, there are a few shops to the north in Abram. And anyway, we’d all had enough by then. 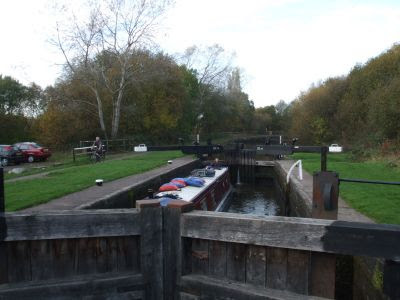 The weather stayed fine for us, I was in T shirt and shorts most of the way, trotting up and down preparing the locks as we went. Some of the gates were in poor condition, though. Gaps on the liners (the sealing edges of the gates) causing a lot of water to leak out. This is why most of the locks were empty. Some interesting flora and fauna, though. It’s been a lot cooler today, a wind from the south and no sun kept the temperature a lot lower than the last couple of days. But we’ve had an enjoyable cruise, heading south now, through mainly rural areas. 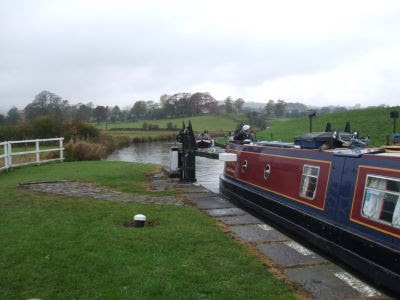 Just 35 minutes after leaving Withnell Fold we started to pass the long line of moored craft on the approach to Johnsons Hillock Locks. These are run by the Wheelton Boat Club. 2 boats were just leaving the top lock as we arrived, so we were able to go straight in, and the rest of the locks were full (or almost) as well, so we had a very quick trip down. Not entirely without incident, though. A combination of the wind and a strong flow over the bywash at one of the locks left Mags stuck across the crest of the bywash weir. 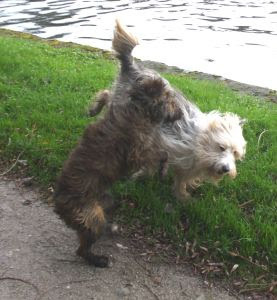 But a bit of welly in reverse and a push off got her clear. 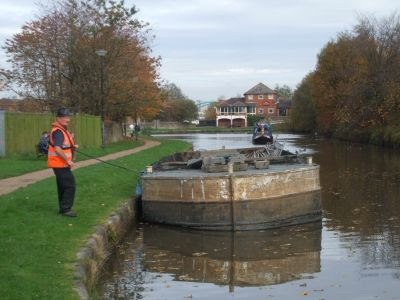 We cleared the bottom lock after just 1 hour 15 minutes, not bad for 7 broad locks over about a mile. 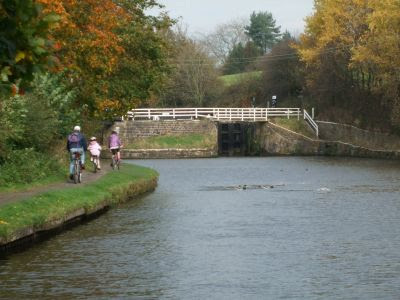 On the left of the picture is the Walton Summit Branch of the Lancaster Canal, now un-navigable, heading off to Preston. 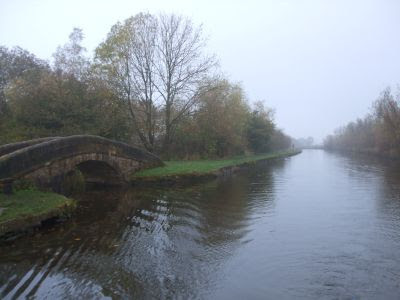 It should have linked up to the southern end of the Lancaster at Preston, after passing over an aqueduct over the River Ribble. But the cost of construction proved prohibitive, and a tramway over a trestle bridge was constructed to link the 2 sections instead. This “temporary” solution remained in use until the branch was closed in 1880. 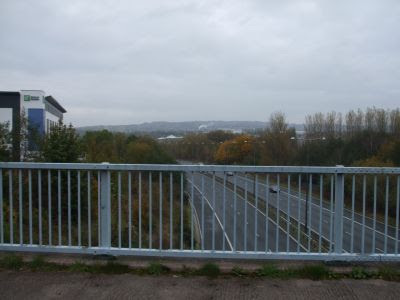 The branch has since been cut in two by the building of the M61. 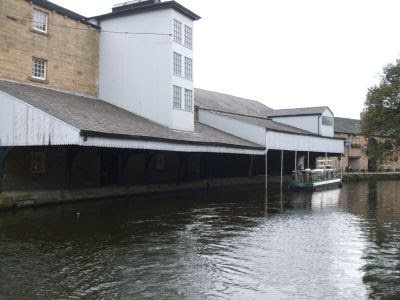 It’s a shame it was never completed; it would have offered a far more suitable alternative to get to the Lancaster Canal than the Millennium Ribble Link. 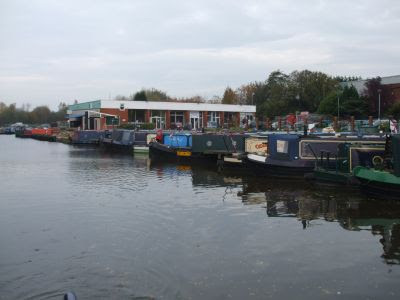 The 7 locks at Johnsons Hillock drops the canal down to the last pound before Wigan. 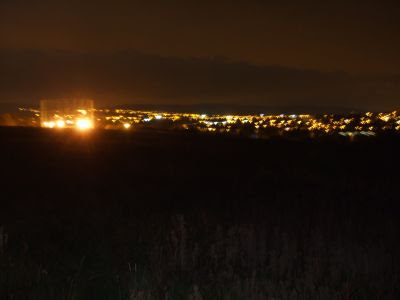 This is 10 miles long, running around Chorley and Addlington. Botany Bay Village was busy, people getting Christmas presents early? 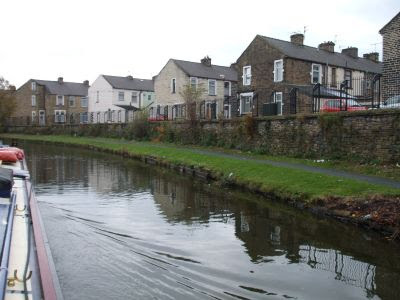 Chorley is only a vague presence on the right side, hardly infringing on the canal corridor at all. 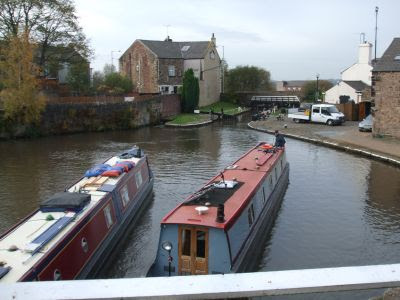 Addlington is much the same, but a mile of offside moorings above White Bear Marina reminds you that you’re not far from civilisation. We came here to look at a boat for sale in 2006. Didn't buy it though. Clearing Addlington the canal is once again in the country, passing Haigh Hall Country Park. It was opposite the golf course here where we decided to pull over for the night. 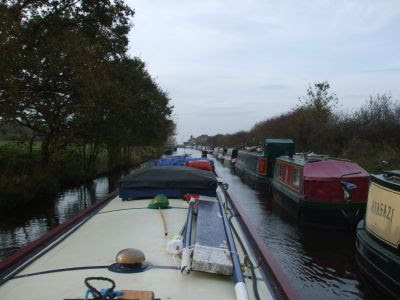 It’s only about ½ an hour from here to Wigan Top Lock, but we’d preferred to be out in the sticks, especially tonight…. The sun was shining as we set off this morning, promising a good day. And it was, very enjoyable. We were entering the retail belt surrounding Blackburn pretty well straight away, car dealerships and carpet and furniture superstores all competing for that elusive pound. Then into more residential areas and older urban industry. Still not as bad cruise, though. 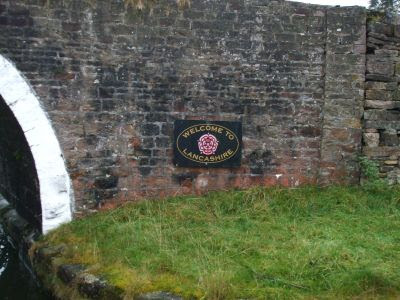 About an hour saw us arrive at Blackburn Top Lock, the first of 6 dropping through the town. 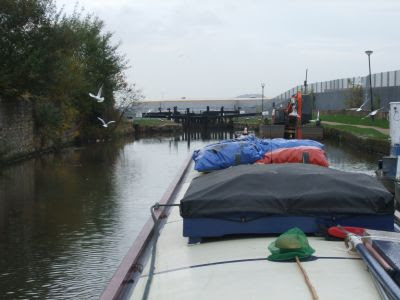 Blackburn Top Lock, seagulls, a dredger and tugs. 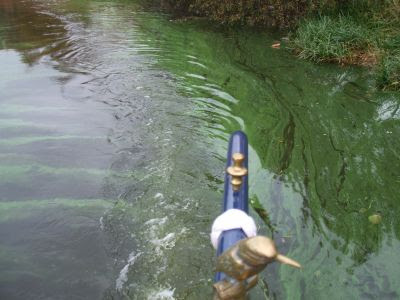 The water up to now had been very dirty, lots of suspended silt and stained plastic and glass bottles. The presence of the dredger explained this. We caught up with the dredging crew part way down the flight. 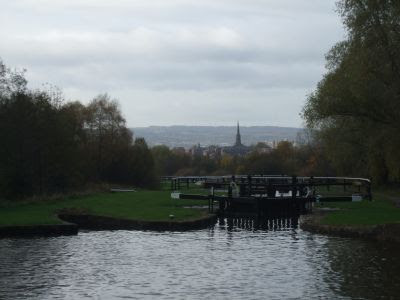 They were moving the gear to the bottom of the flight to continue with the good work, having done all the bridge ‘oles through the town, and a good stretch above the locks. 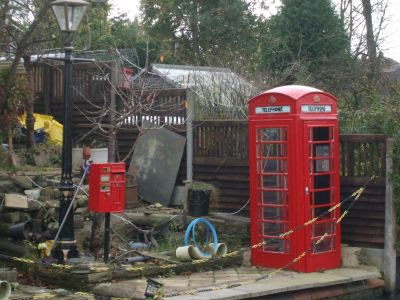 The only problem was, the locks are not big enough to accommodate a pan (the unpowered barge used as a floating skip) and a tug at the same time. So each of the pans had to be hauled down the flight by hand. Thankfully they’d emptied them at the top of the flight, otherwise it would have been really hard work! Bow hauling down the flight. Understandably this slowed us down a bit, but I had a very interesting chat with the gaffer. 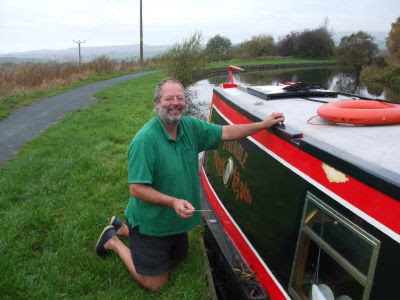 He’s an ex boatman who used to run general cargoes on the Grand Union, Nene and North Oxford and Ashby. He came off the water in 1969, as things were getting pretty bad by then, very few loads and the structure of the network falling apart. Man on bike sculpture outside the Groundwork Trust Office. Unusual gate gear on the bottom gates of L56. When the road was widened there was no room for conventional balance beams, so a quadrant shaped rack and pinion arrangement was installed instead. It’s a pity there’re not all like this, they’re a lot easier to use! We dropped out of the bottom of the flight just before noon. The 3 pans are those that have been hauled by manpower down the flight. The crew were heading back up to fetch the dredger next, then the 2 tugs. 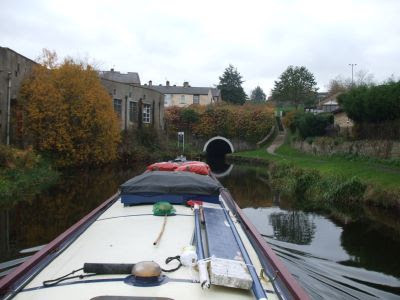 Leaving the town the canal passes through residential suburbs, giving us the chance to inspect peoples back gardens. 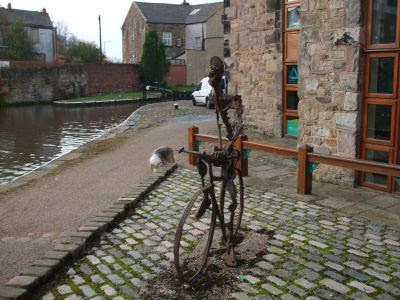 This chap must collect street furniture…. 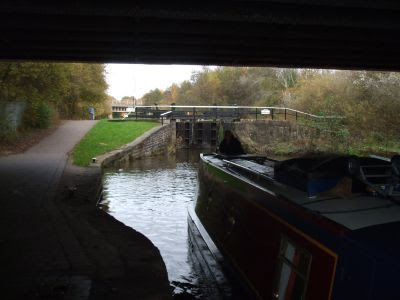 Then we moved out into the country, under the M65 for the last time as we headed more southerly towards Chorley and Wigan. We pulled over on the VM at Withnell Fold at around 2 o'clock. 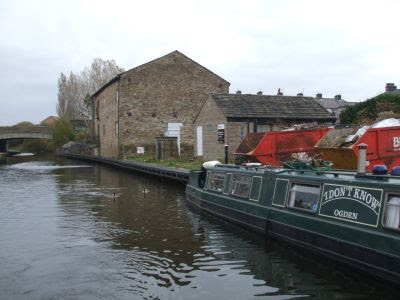 Withnell Fold Visitor Moorings, opposite one of the old paper mills. Opposite is one of the paper mills that used to be dotted about the area, making use of the many streams and rivers coming from the higher ground. The building now houses several industrial units. 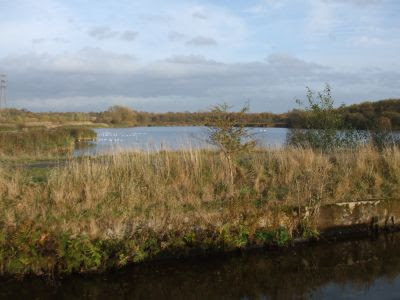 The old filter beds and sludge lagoons have been adopted by wildlife and are now a nature reserve. The village of Withnell Fold is interesting. Built in 1843 to accommodate workers in the paper mill, it used to have a Co-op, school/chapel and Reading Room. These buildings still exist, though now are residential. The earliest houses were built in the form of a hollow square, with one side missing. 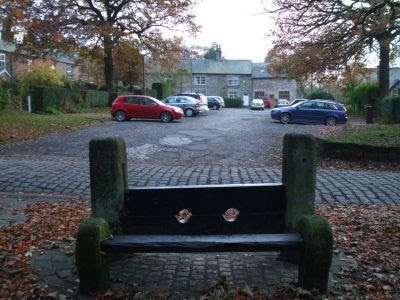 Occupying the gap is the village stocks! Cobbles are still in place on most of the streets. 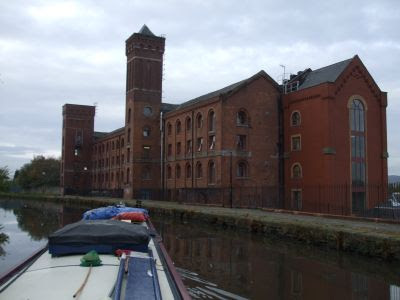 The owner and builder of the mill and village went by the wonderful name of Thomas Blinkhorn Parke and came from a Chorley family of cotton mill owners. There’s a lot of info here. 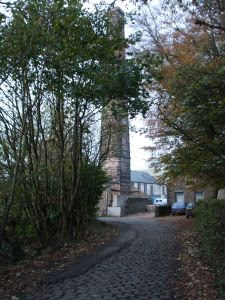 The distinctive mill chimney was saved from demolition by the villagers. We made our farewells with Geoffrey this morning. 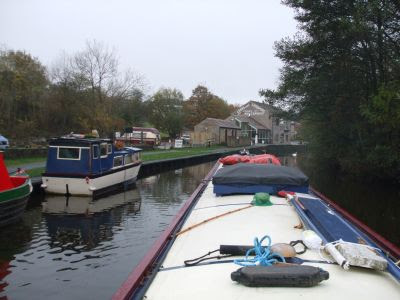 He’s going into Burnley for a look around before returning Scrumble to Lower Park Marina at Barnoldswick. 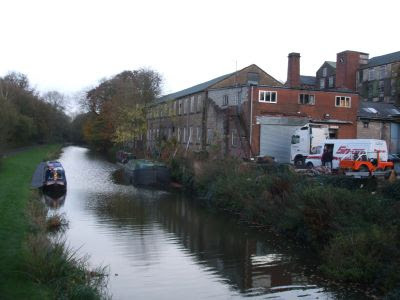 We may meet up again, he has a boat of his own in the marina at Braunston, but chose to hire up here rather than make the long trip by water. We'll miss him, he's been good company these last 2 days. 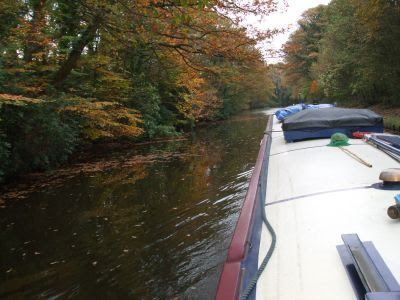 From our overnight mooring we were pretty well straight into Burnley. 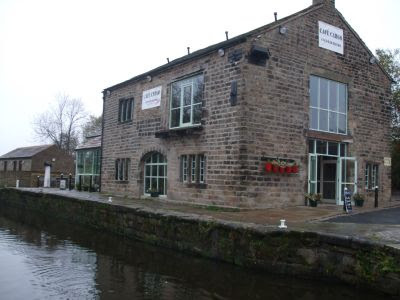 The canal does a long loop around the town which is built in the Calder Valley, crossing the valley on a mile long embankment which affords fine views of rooftops. 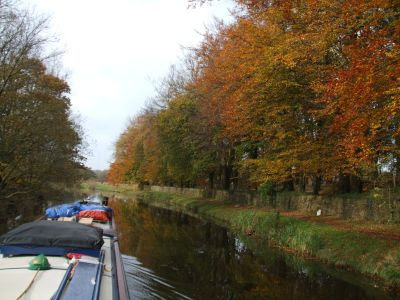 Heading back out, the canal cuts through the Weavers’ Triangle. This is a preserved 19thC industrial area demonstrating the business upon which the town’s prosperity was built. From Burnley the canal crosses the M65 for the first time, in fact the first of 6 crossings today, 2 over and 4 under, as the motorway heads roughly east to west over bridges and embankments and through cuttings, while the canal loops around the hills, tenaciously following the 410 foot contour. 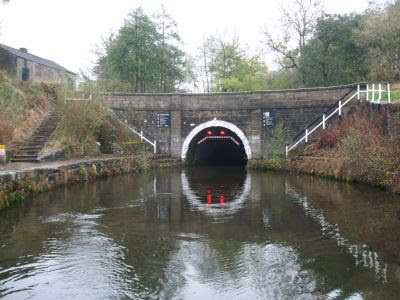 Gannow Tunnel takes the navigation into the suburb of Rose Grove, which has a useful BW sanitary station and moorings at the depot there. 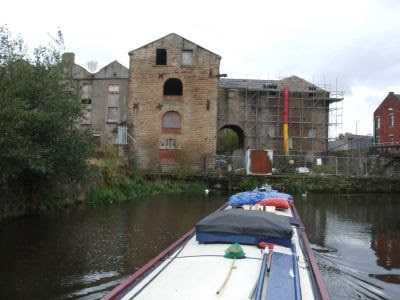 There’s a sort of rural section for a while, just odds clumps of recently built houses coming down to the canal. 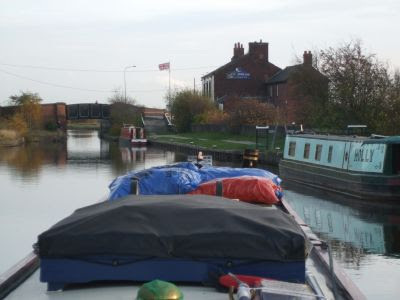 We pulled in at Hapton Marina for diesel (at 58ppl) and solid fuel (at £6 for 20Kg) and a chat, then pushed on through a couple of miles of open country before running into Clayton le Moors, Church and Rishton. Old mill in Church, looks like an abandoned development project. We pulled over in another green zone between Rishton and Blackburn, near Bridge 106. 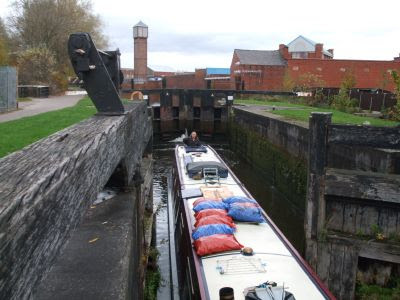 No locks today, but the long pound ends in the middle of Blackburn at the 6 locks that drop the canal down another 55 feet. But that’ll be tomorrow. We’ve picked up quite a bit of rubbish on the prop today, as expected when running through urban areas. I’ve been head down in the weed hatch 3 times today. I reckon it’ll be pretty much the same tomorrow. Yes it’s official. Today we left “God’s Country”, and entered that other county that Yorkshire folk don’t like to talk about…. Geoffrey on Scrumble passed us not long after 09:00 this morning, just as we were thinking about getting going ourselves. So we set off in his wake, catching up at Foulridge Tunnel waiting for the lights to change. Foulridge Tunnel is one way only, alternating northbound and southbound every 30 minutes and controlled by traffic lights. We arrived just on 10, and the lights had just changed so in we went without a pause. 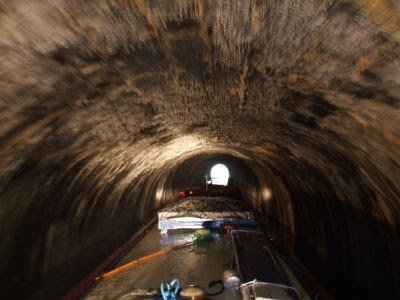 At 1640 yards it’s quite short compared to a lot of canal tunnels, but, being wet, it has some impressive flowstone deposits, caused by minerals leaching through the roof. Not a good picture, the white covering on the ceiling is a mass of short stalactites. 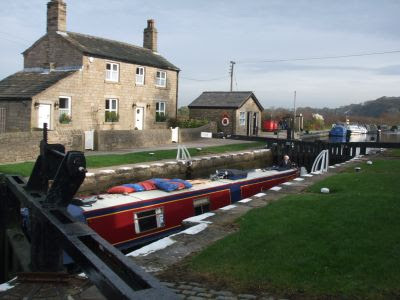 Around 1½ miles on a long line of moorings indicates the approach to Barrowford Top Lock. 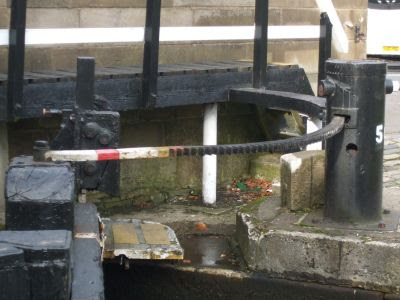 Top lock because we are now dropping back down off the summit level. Not all boats could be classed as being moored though. 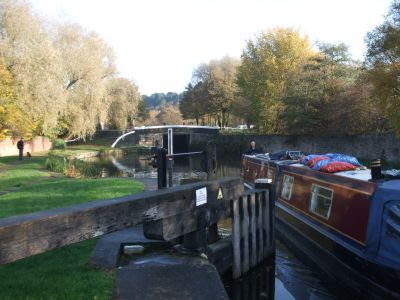 This is a pleasant flight of 7 locks, starting in fields and dropping down to a semi rural bit between Colne and Nelson, with a mess of bridges ¾ of the way down. We met a couple of boats on the way up, and made good time till the last but one. A boat was approaching the bottom, so Mags and Geoffrey waited in the pound while I filled the lock with the oncoming boat in. Unfortunately, this drained the pound enough to leave Mags high and dry on some rocks. A lock full of water from above soon had her floating again though. 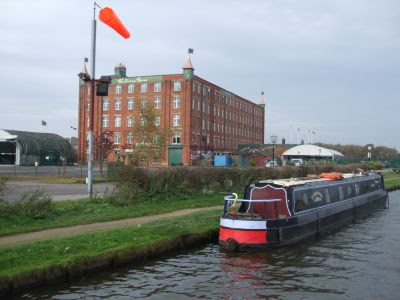 Out of the locks and we were into Nelson, the first of a string of mill towns on the canal as it drops towards Liverpool. 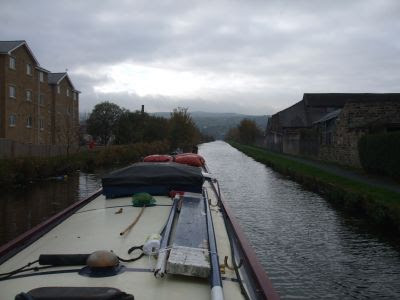 Geoffrey pulled onto the handy offside moorings at Morrisons, while we pushed on, finally mooring just north of Burnley. We’ve stopped here before, with long views over the Calder Valley. We’re Off!! A long day starts us heading South.